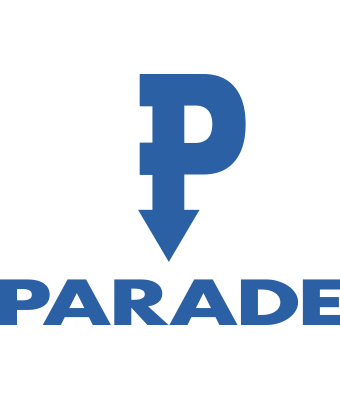 As part of the Paradise Circus Urban Regeneration Scheme in Birmingham City Centre, Parade Civil Engineering Limited were appointed to carryout road marking and civils works on A4400 Great Charles Street. 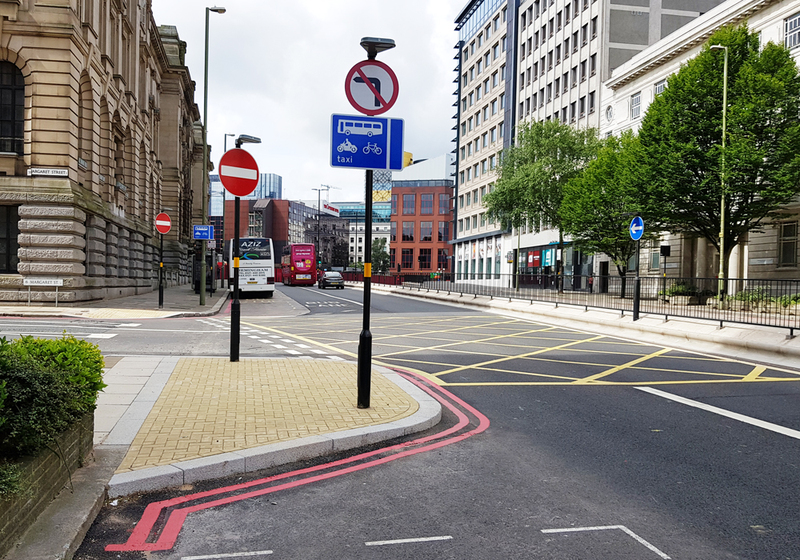 Works consisted of amending existing road markings to implement a designated bus lane, the construction of several build-outs in high quality granite products, ducting works for electrical connections, installation of posts, signs and Vehicle Activated Signs (VAS). Due to heavy vehicular traffic and high levels of pedestrian flows in the City Centre these works were commissioned as night time working only. An innovative scheme designed and delivered by Birmingham City Council as part of the Birmingham Cycle Revolution, with the aim of providing additional cycle parking and cycle maintenance facilities within the City Centre. 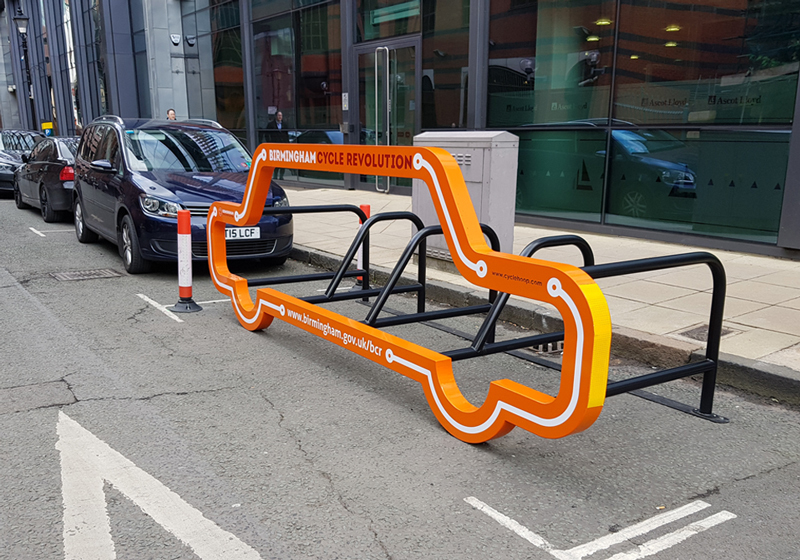 The scheme consisted of installing bespoke styled bike ports, cycle racks, cycle stands and cycle maintenance stations within a number of prime locations throughout Birmingham City Centre. The aim of the scheme was to improve the street scene of Wolverhampton City Centre’s High Street, a busy commercial area in the City Centre with high pedestrian flows and a number of high profile shop frontages. The scheme consisted of upgrading existing carriageway and footways with high quality granite paving materials, carriageway surfacing in buff SMA, imprint and road marking works, installation of tree pits and street furniture including a bespoke cycle shelter, cycle stands, benches, bins and bollards. 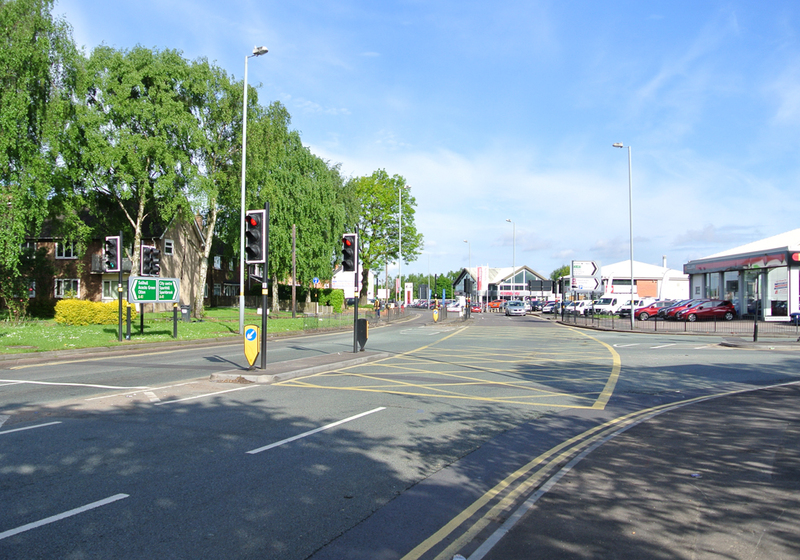 A major upgrade of this busy signalised offset junction on one of the City’s main arterials involved the provision of two new Toucans linked to the existing traffic controller and included traffic signage, ducting and cabling, furniture, pedestrian refuges and road markings. The scheme consisted of constructing a 1450m2 car park within a four week time period, in advance of the School summer holidays. Works included earthworks, surveying and levelling, drainage, construction of soakaways and inspection chambers, kerbing and paving works, carriageway and footway construction, landscaping, installation of timber trip rail, street lighting, commissioning of parking meters and road marking works. 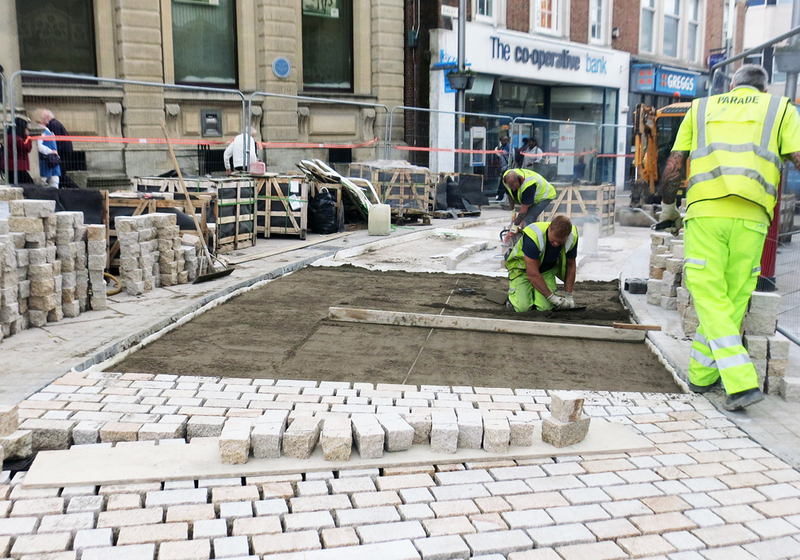 Part of the City’s capital programme, the scheme involved the construction of a new tree lined central reservation in high quality stone paving together with junction entry upgrades in matching stone setts and included, traffic signage, furniture and road markings. 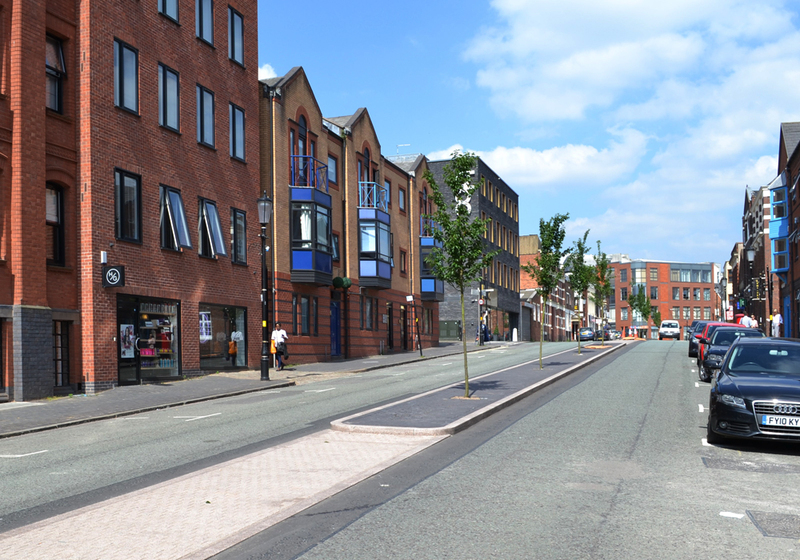 The works location in a busy business precinct of the City’s Jewellery quarter required extensive consultations with all Stakeholders in order to provide a safe environment for road workers and users with the minimum of disruption. 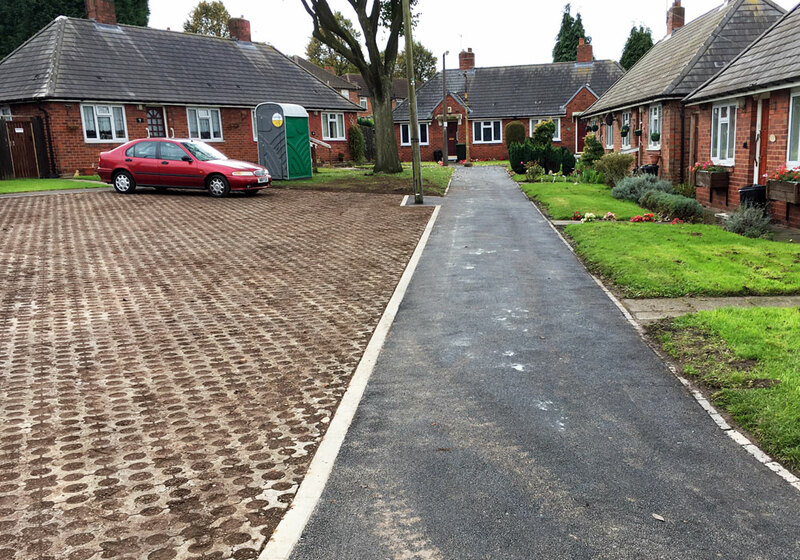 The scheme was delivered by the Local Authority and the Housing Association in order to provide local residents with car parking facilities. 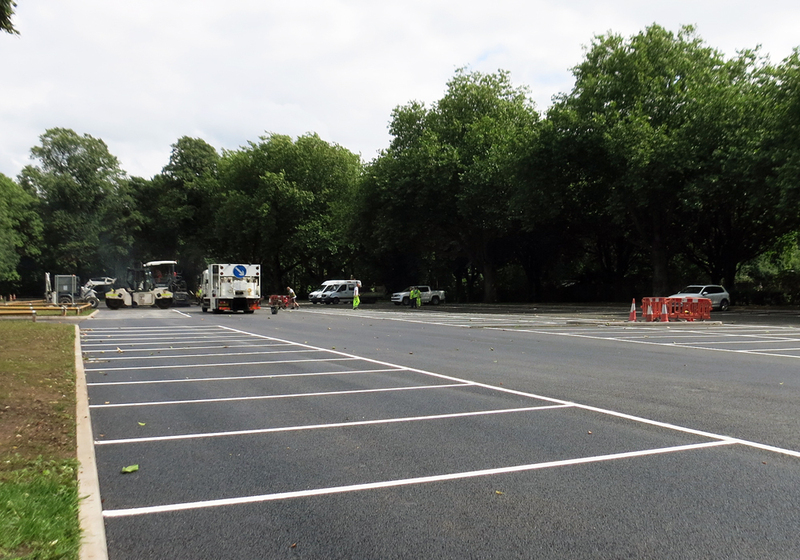 Works consisted of removing a number of mature trees, constructing a car parking area using grass grid paving, construction of footpaths and landscaping. 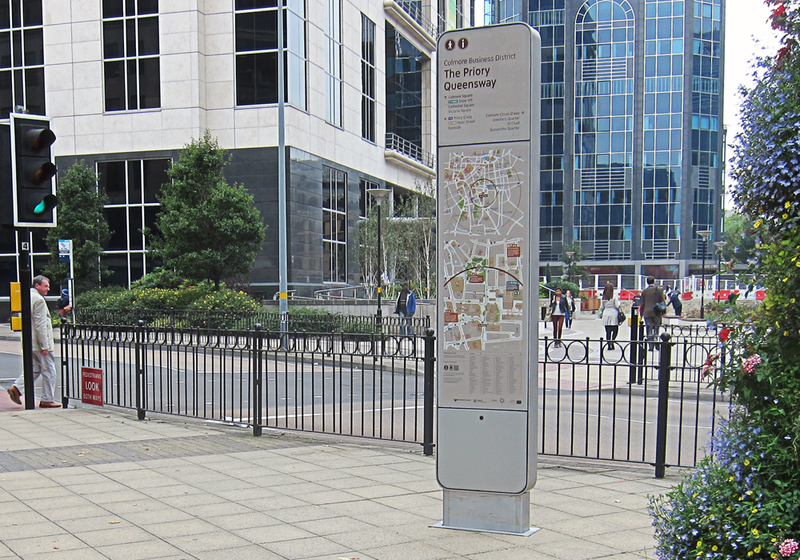 This was the second phase we undertook as part of the City’s programme for the provision of illuminated wayfinding Totems. Our works included taking delivery and erection of the units on preformed foundations together with providing them with electrical power. The locations were all within the busy City Centre roads or the canal towpaths which caused difficulties with access and the traffic management of pedestrians. 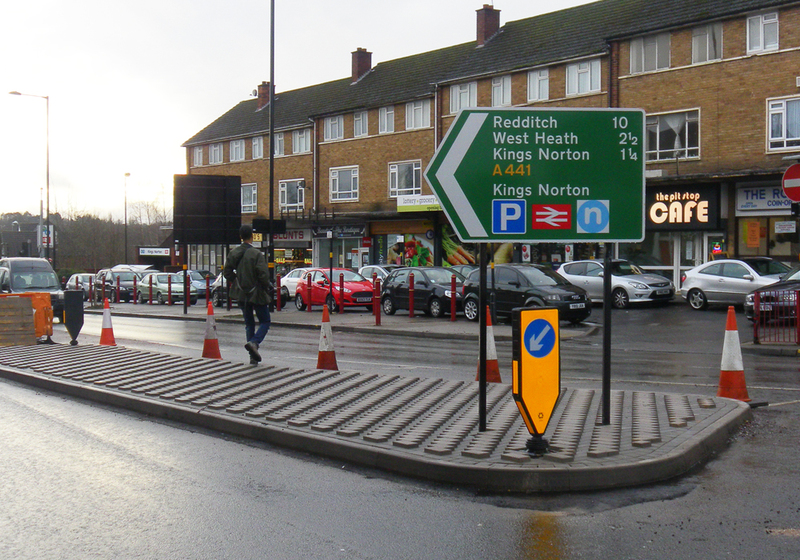 A major part of the City’s ongoing Cycle Route programme, the project involved a series of schemes along the A441 Pershore Road Corridor from Belgrave Interchange to Kings Norton Green. The works included implementation of bus lanes, ten signalised pedestrian crossing upgrades, build outs, pedestrian refuges, extensive signage, and road marking amendments. The Cotteridge Local Centre scheme was part of the City’s Capital Budget and carried out at the same time as the Selly Oak Local Centre scheme. Both schemes were similar in nature and location; busy shopping precincts with upgraded Bus Interchanges and new signalised pedestrian crossings required similar solutions to minimise disruptions to highway users, local businesses and bus companies. Shop frontages were rekerbed and repaved with bright modular elements to create additional parking and improved access for shoppers. 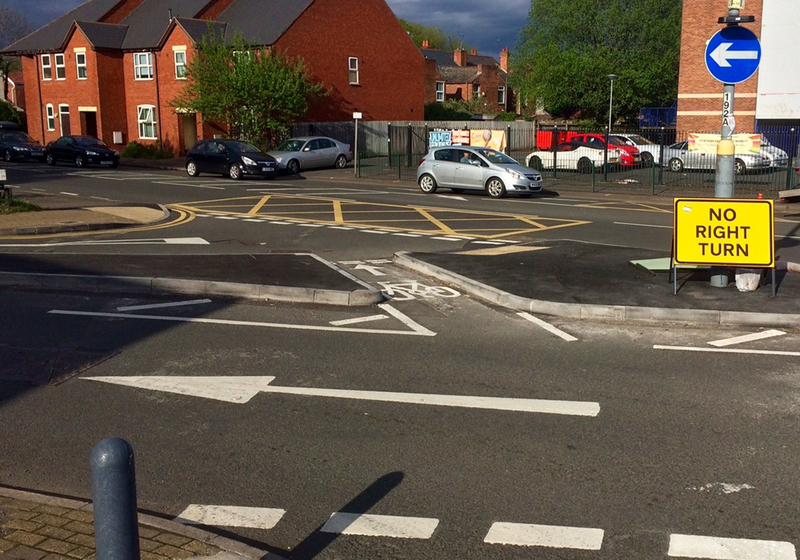 The scheme consisted of upgrading a busy crossroads junction in Selly Oak to a continental style roundabout, which aimed at reducing the number of vehicular / cyclist accidents. 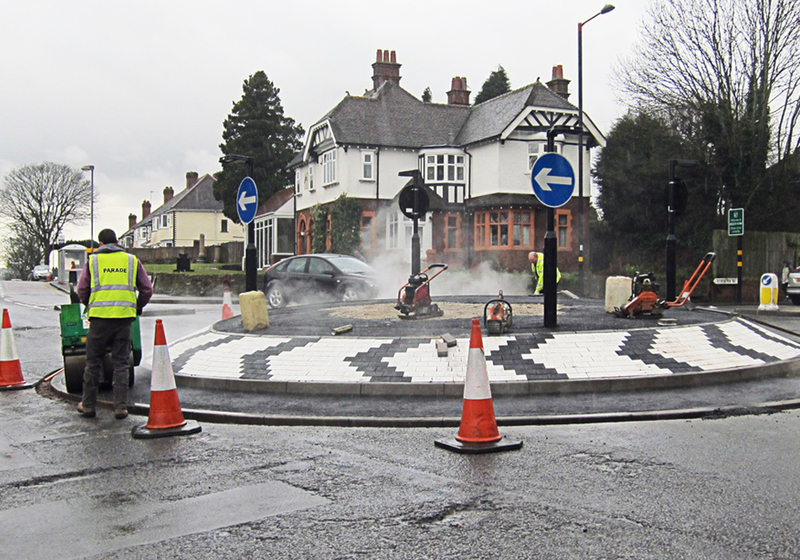 The works consisted of constructing a roundabout with pedestrian refuges, ducting and drainage, carriageway planing and resurfacing, organising electrical connections and disconnections, and maintaining vehicular and pedestrian traffic management throughout the scheme. 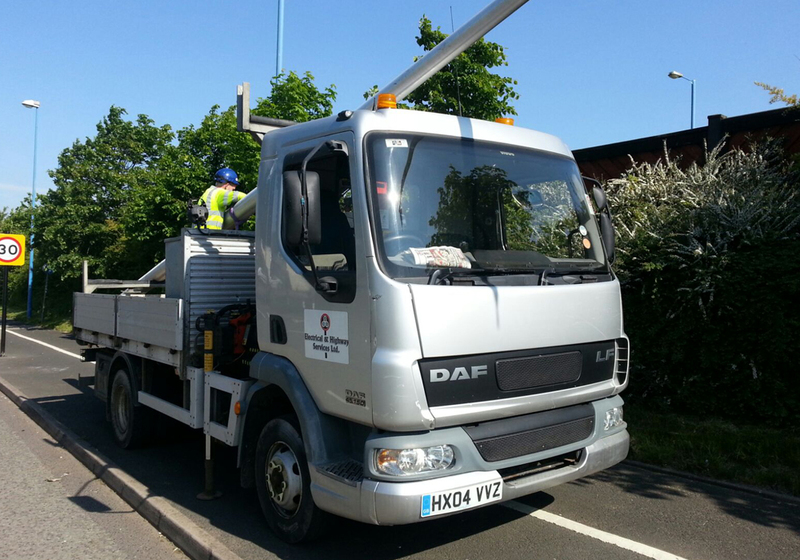 The scheme was an early section of the Borough’s programme for upgrading all street lighting to LED and the installation of CMS nodes to facilitate remote monitoring and control. The works involved the replacement of 220 No. existing street lighting lanterns on a point for point basis on roads within the Borough of Sandwell, and included: structural visual inspection, replacement of lanterns, installation of nodes, electrical certificate, provision of manufacturer’s warranty for the lanterns and data to implement CMS control.